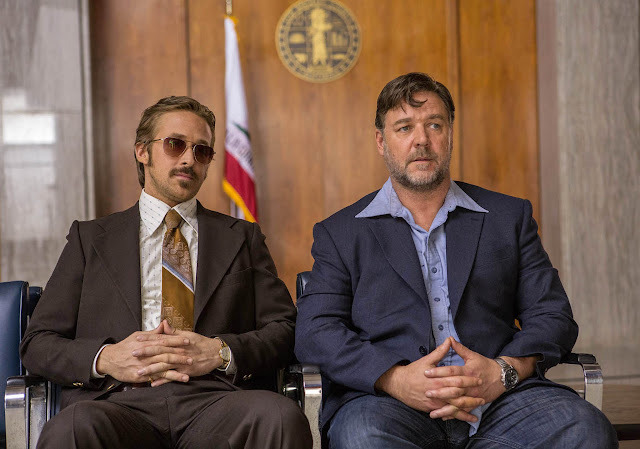 A couple of weeks back I was fortunate to go along to an early screening of Shane Black's The Nice Guys starring Russell Crowe and Ryan Gosling. By now you probably know it is a “buddy movie”. A sub genre that cumulatively led to, and, peaked with brilliance in the late 80s with some genuinely engaging films either benefiting or hinging on an odd couple pairing - tinged with drama and humour like; Gene Wilder & Richard Pryor continuing their hilarious partnership with Sidney Poitier's brilliant Stir Crazy (1980), Nick Nolte & Eddie Murphy in Walter Hill's 48 Hrs. (1982), arguably, as it was heavy on the humour and less focussed on the danger - Chevy Chase & Dan Aykroyd in John Landis' Spies Like Us (1985), Billy Crystal & Gregory Hines in Peter Hyams' Running Scared (1986), Danny Glover & Mel Gibson in Richard Donner's Lethal Weapon (1987), Arnold Schwarzenegger & James Belushi in Walter Hill's Red Heat (1988), Robert De Niro & Charles Grodin in Martin Brest's Midnight Run (1988) and Bruce Willis & Damon Wayans in Tony Scott's The Last Boy Scout (1991) since then there have been flashes every now and then of the old buddy magic like Robert Downey Jnr. & Val Kilmer in Shane Black's Kiss Kiss Bang Bang (2005), Sean Pegg & Nick Frost in their and Edgar Wright's Three Flavours Cornetto trilogy and Sandra Bullock & Melissa McCarthy in Paul Feig's The Heat (2013), there are probably many more but I can't think of them off the top of my head right now. 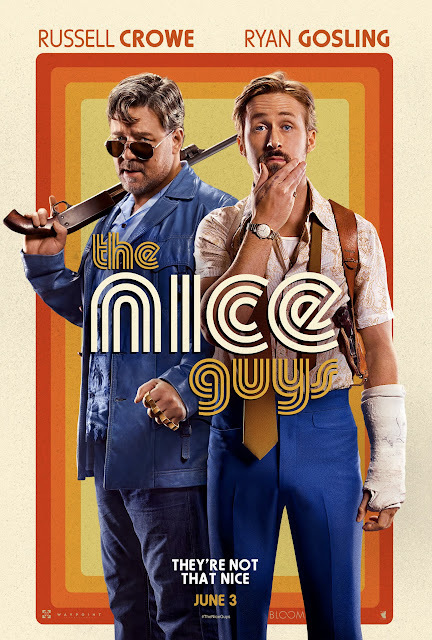 Of the highly entertaining films I mention above Shane Black and Producer Joel Silver have worked on 3 together (if you don't include the sequels): Lethal Weapon, The Last Boy Scout, Kiss Kiss Bang Bang and now a fourth The Nice Guys. I mention these films so we have a shared basis of understanding of the type of film this partnership has a pedigree of producing and if you have seen any of the above films you will know what to expect from The Nice Guys that is: an unexpected odd ball pairing, with both partners having their own history, tribulations and personal quirks. Thrown into a very modern mystery firmly echoing all the hallmarks of classic film noir. Lots of dastardly villains to foil our heroes with some of the best post modern dialogue and banter you'll hear in film to keep the story balanced between hilarity and danger. I also mention the above films, as given their existence Shane Black has the unenviable task of panning for gold in waters that may have already seemingly been overfished. Yet Shane Black manages to pull another great buddy film out the bag that whilst arguably it may not be wholly unique the characters and direction he takes with The Nice Guys certainly is. If you enjoyed any of that from their previous efforts you are going to love The Nice Guys, if you didn't like any of those films you are probably going to love The Nice Guys anyway as the cast will win you over. The Nice Guys is (mostly) set to the sleaze and the lewd glitz of 70s Los Angeles (not at Christmas) and into this world comes crashing - Misty Mountains played by Murielle Telio. The Nice Guys suprise us! In keeping with Shane Black's multi layered style The Nice Guys starts with an homage to Black & Silver's first buddy film together - Lethal Weapon as in a similar way we are introduced to Misty Mountains the character at the heart of the mystery that engulfs are heroes. This trope is in itself a reference to a running joke about women falling in Lethal Weapon Director Richard Donner's films. Before being introduced to Russell Crowe's Jackson Healy and Ryan Gosling's Holland March. Crowe's Jackson Healy is a lumbering and oafish muscle for hire with a heart of gold. Whilst Gosling's Holland March is a burn out ex cop turned private detective trying to look after his daughter Holly played by Angourie Rice. And this trio will win you over - Russell Crowe with his lonely guy good nature, Ryan Gosling with his hilarious turn as the worst father, well generally just dis-engaged and shadiest person ever and Angourie Rice's innocent but moxie Holly as they are thrust into a very cynical and dangerous world. It is the relationship between this unlikely trio that becomes the core of the film. There is definitely a mystery to be solved, a contrived conspiracy with evil villains, whimsical referential side plots, cracking banter & one liners as well as all out gut busting hilarity but all that fades into the background (apart from pretty awesome 70s styles soundtrack with songs from the likes of Earth, Wind & Fire, Kool & The Gang and Rupert Holmes) as the relationship between the three becomes the real focus of the film and you want these three well intentioned but hopelessly dysfunctional people to make it to the end in this anything can happen universe. This re markable shift from over egging of plot twists and high explosions may be the sign of a more mature Shane Black (although I was quite happy with the earlier version) he certainly creates escapist movie magic with The Nice Guys and I hope to see him bring Russell Crowe's Jackson Healy and Ryan Gosling's Holland March back to the screen as their back stories and the dynamic duo trio's collaboration begs for a return of The Nice guys. Boasting an all-star cast including Ryan Gosling, Russell Crowe, Kim Basinger, Matt Bomer and Keith David, The Nice Guys is released in UK cinemas this Friday. A Silver Pictures Production in association with Waypoint Entertainment, “The Nice Guys” will be released in the UK Friday 3rd June 2016, by Icon Film Distribution. The film also stars young actress Angourie Rice, Matt Bomer (the “Magic Mike” films, HBO’s “The Normal Heart”), Margaret Qualley (HBO’s “The Leftovers”), Keith David (TV’s “Community”) and Oscar winner Kim Basinger (“L.A. Confidential”). Shane Black directed the film from an original screenplay he wrote with Anthony Bagarozzi. Joel Silver (“Non-Stop,” “The Matrix” films, the “Sherlock Holmes” films) produced the film under his Silver Pictures banner. Ken Kao, Hal Sadoff, Alex Walton and Michael J. Malone served as executive producers. The behind-the-scenes creative team included Oscar-winning director of photography Philippe Rousselot (“A River Runs Through It,” the “Sherlock Holmes” films), production designer Richard Bridgland (“Serena,” “Unknown”), editor Joel Negrón (“21 Jump Street,” “Transformers: Revenge of the Fallen”), and costume designer Kym Barrett (“The Matrix” films, “The Amazing Spider-Man”). The score was composed by John Ottman (“X-Men: Days of Future Past”) & David Buckley (TV’s “The Good Wife”).